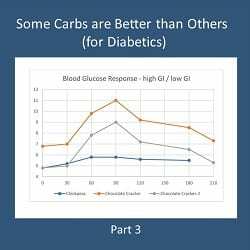 INTRODUCTION: In the first article in this series on carbohydrates, I explained that Glycemic Index (GI) is a way to rate carbohydrates based how easily they raise the blood sugar of healthy people and that some carbohydrates are better than others when they cause much less of a rise in blood sugar. 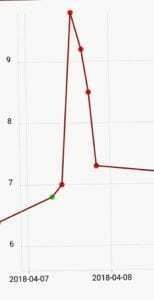 I wanted to know how would I react to carbohydrate-based foods now that I have been eating low carb for over a years and have seen a partial reversal of Type 2 Diabetes that I had for more than 10 years. I decided to conduct some impromptu ‘experiments’ and the results led to some reading in the scientific literature. The information I discovered is VERY exciting for me and for others with Type 2 Diabetes or Insulin Resistance. Once people have achieved significant reversal of symptoms following a therapeutic low carb or ketogenic diet, there is a way to logically begin to re-introduce carb-based foods in a way that doesn’t cause their blood sugar to spike. As you may recall from the first article in this series on Carbohydrates, the Glycemic Index of a food is determine by having healthy people eat 50 grams of digestible carbohydrate of a given food, and then measure their blood glucose response over a 2 hour period (30 minutes, 60 minutes, 90 minutes, 120 minutes), plotting the curve then measuring the area under the curve (AUC) and comparing it to the AUC of pure glucose, the reference food. The problem with the Glycemic Index or even the Glycemic Load (based on individual serving sizes) is that this data does not apply to those with Diabetes or Insulin Resistance. I ate 1/2 cup of chickpeas (cooked from dried) which has 25 g of carbohydrate and measured my blood sugar response with the same meter at 30 minutes, 60 minutes, 90 minutes, 120 minutes, 180 minutes and 210 minutes. At the time I did this, I hadn’t eaten in 8 hours (considered a fasted state) and my starting blood sugar was 4.8 mmol/L (86 mg.dl). The chickpeas were part of a mixed meal with some chicken (high biological value protein) and a cucumber salad with olive oil. At the highest point, my blood sugar went up to 5.8 mmol/L (105 mg/dl), stayed there, then started to drop at 2 hours. When I first began changing my lifestyle a year ago, even eating low GI foods such as chickpeas caused my blood sugar to jump dramatically. I recall the first few months when I would eat 1 cup of hummus, which is chickpeas with tahini (ground sesame seeds) and has even more fiber than chickpeas alone and also has only 25 g of carbs, my blood sugar would always go up to ~ 8.6 – 8.9 mmol/L (155- 160 mg/dl). What I’ve since found out (and will explain this more in detail in an upcoming article) is that intact legumes have a very different impact on blood glucose as to ground ones. The more intact a legume or bean is, the lower the blood glucose response. As I said, more on that in a future article. Two weeks ago, I was at a social occasion where a milk-chocolate covered cracker was served and I decided (in the interest of science, of course!) to read the nutritional label, measure out exactly 25 g of carbohydrate of this food and eat it, measuring my blood sugar at 0 minutes, 60 minutes, 90 minutes, 120 minutes, and 180 minutes. This ‘reference food’ (high GI) was eaten after a dinner that had a fair amount of high biological value protein (steak) as well as some healthy fats (olive oil on vegetables) and fiber in the vegetables, and my starting blood sugar was 6.7 mmol/L (121 mg/dl). 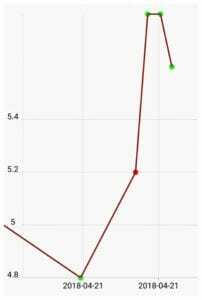 Just look at the blood sugar spike! When I ate 25 gm of carbohydrate as the cracker and chocolate, my blood glucose went from 6.7 mmol/L to 9.8 mmol/L (121 mg/dl -177 mg/dl)! That is, I had eaten the SAME amount of carbohydrate (25 g of carbs) as when I ate the cooked chickpeas and had THREE TIMES the blood sugar response!! Both the meals I ate just before the ‘reference food’ (high GI, cracker with chocolate) and the ‘test food’ (low GI, chickpeas) had a high biological value protein (chicken, steak) which slows the blood sugar response of the body, and both had the same amount of fiber (the exact same salad). Below is a graph of the two responses (chickpeas in blue, chocolate covered cracker, orange) over 3+ hours. It is quite evident that 25 g of carbs as high GI white flour with milk chocolate is processed VERY differently by my body than 25 g of carbs as low GI chickpeas!! The area under the curve (AUG) was determined by lowering the cracker and chocolate curve down to sit just above the chickpea curve (grey curve) and then assessing where the respective points were and running the AUG formula relative to baseline. The AUG of 25 g of carbs as chickpeas was 129. The AUG of 25 g of carbs as white flour cracker with chocolate was 381. 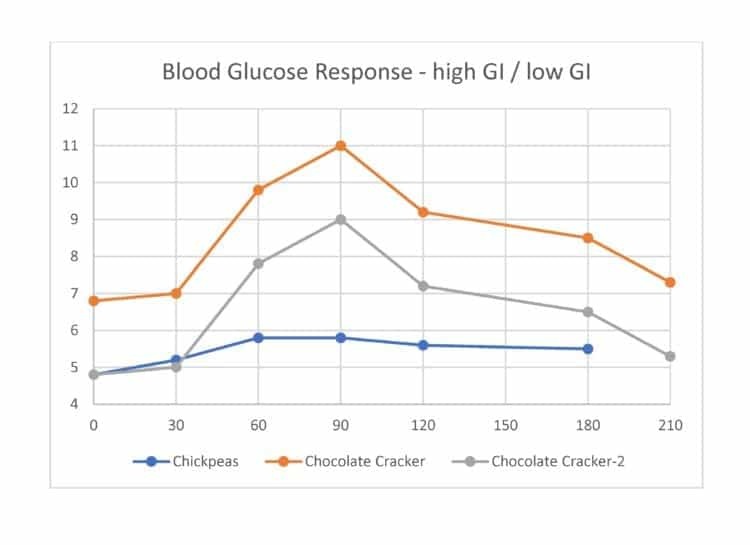 The blood sugar response of the cracker with chocolate was THREE TIMES GREATER than the blood sugar response of the chickpeas – and both contained 25 g of carbs! * As I will elaborate on below, people’s blood sugar response to different carbohydrate-based food is quite individual. I was able to find for purposes of estimation, that 25 g of carbohydrate as white bread with 5 g of margarine (a pretty good facsimile for 25 g of carbohydrate as white flour cracker covered with milk chocolate made with palm oil) has a GI of 70.1 when compared to the reference which was 25 g glucose in 125 ml water . A meta-analysis of 10 studies on the effect of pulses (legumes) eaten alone on blood sugar control in people with and without Diabetes  provided some helpful information. The pulses in the meta-analysis included chickpeas, black-eyed peas and various other beans (including red and white kidney, black, pinto, fava and white navy). Seven of the 10 trials that looked at the effect of eating pulses alone had a crossover design (five had a washout period), studied a total of 253 participants, of which only 21 had Type 2 Diabetes, and 232 that had normal blood sugar. Background diets were largely high-carbohydrate, low-fat diets (carbohydrate 52% of energy, protein 18% of energy, fat 29% of energy). Due to the length of time I have had Type 2 Diabetes and the very high degree of persistent insulin resistance over the first 6 months of eating low carb but not ketogenic, the last 6 months my diet has been very low in carbohydrate (5-10% of energy), moderate in protein ~23% and 67-77% healthy fats. It was found that fasting blood glucose following the eating of pulses alone was decreased by 0.82% (95% CI ), but there was no long term effect on HbA1C (3 month average blood sugar) or on HOMA-IR (fasting blood glucose: fasting insulin). The conclusions of the meta-analysis found that the strongest modifiers of benefit were in Type 2 Diabetes and that the legumes that modified blood sugar the most were black beans, white/navy beans, pinto beans, red and white kidney beans, chickpeas and fava beans. A 2015 study from Israel with 800 people who were monitored with continuous glucose monitors indicates that there isn’t a ‘universal’ blood sugar response to low GI foods or high GI carbs – that glycemic (blood sugar) response is very individual. “We continuously monitored week-long glucose levels in an 800-person cohort, measured responses to 46,898 meals, and found high variability in the response to identical meals, suggesting that universal dietary recommendations may have limited utility. The study also found that an individual’s blood sugar response to different foods was able to be predicted by type and amounts of bacteria in their intestines (the ‘gut biome’ / ‘microbiome’ / ‘microbiota’) . Based on the data they collected, the team has since created and validated a machine-learning algorithm that combines blood parameters, dietary habits, anthropometrics (height, weight data), physical activity and gut microbiota data that they say accurately predicts a person’s individual post meal blood sugar response to actual meals. There is a tremendous opportunity for Dietitians such as myself to help individuals with Type 2 Diabetes or pre-diabetes determine which carbohydrate-based foods cause the lowest, most gradual rise in blood sugar. This means that after individuals have had significant reversal of Type 2 Diabetes / Insulin Resistance following a therapeutic low carb diet for a period of time, I can help them re-introduce carb-based foods back into their diet by selecting ones that have the least impact on their blood sugar! USING EXISTING BLOOD GLUCOSE METER – I can help those with Type 2 Diabetes eat a specific amount of a ‘test food’ that contains 50 g of carbohydrate (I will calculate this for them) and have them test their blood sugar every 30 minutes for 2 or 3 hours with the blood glucose meters they already have. Then, I can take that data, enter it into an Excel sheet just as was done with my data above, and determine their blood sugar response. USING A CONTINUOUS GLUCOSE MONITOR – continuous glucose monitors (CGMs) such as the FreeStyle Libre have become relatively inexpensive and would be ideal for this kind of testing. Test strips for most standard home blood glucose monitors are $1 a piece, so testing every 30 minutes for 3 hours costs $6. The FreeStyle Libre costs $50 for the unit, and while test patches are $90 and last only two weeks, huge varieties of carbohydrate-based foods can be tried and measured in a short time, with no effort. As a Dietitian I can not only help individuals carry out this kind of individual testing of carbohydrate-based foods, I can help them interpret the results as we begin to re-introduced some foods back into the diet once significant reversal of insulin resistance has been accomplished. Do you have Type 2 Diabetes or pre-diabetes and want help to determine which carb-based foods don’t spike your blood sugar? Or do you have questions about how I can help you reverse the symptoms of Type 2 Diabetes or insulin resistance ? Please send me a note using the “Contact Me” form on this web page and I will respond to you shortly. Aston LM, Gambell JM, Lee DM, Bryant SP, Jebb SA. Determination of the glycaemic index of various staple carbohydrate-rich foods in the UK diet. European journal of clinical nutrition. 2008;62(2):279-285.